What does creativity mean to you? That is a HUGE question for photographers. Dylan Goldby reached out to a number of photographers in South Korea to put together a presentation on that topic. I spent a weekend in Seoul exactly what creativity means to me. It started with a conference and then ended with a tip inside my own motivations. I walked around Olympic Park and then unexpectedly stumbled into an exhibition of Henri Cartier-Bresson’s work. I left Seoul with a clearer vision of my own creative motivation. On January 31st, 6 awesome photographers met up near Topgol Park to spend the next 6 hours talking about what drives them forward, what makes them keep going and the challenges they face. It was an eye-opening experience. The Gyeongbokgung (palace greatly blessed by Heaven) built in 1395, is the biggest palace in Korea. It was totally reduced to ashes during the Japanese invasion in 1592. It was then rebuilt again in 1867. Again, it was torn down in 1915 by the Japanese. It is from 1990 that the palace has been restored and renovated to its present glory. Korean history is such a sad story. Always filled with war, slavery and fear... Even now, North Korea seem to pose a pertinent threat to the South. 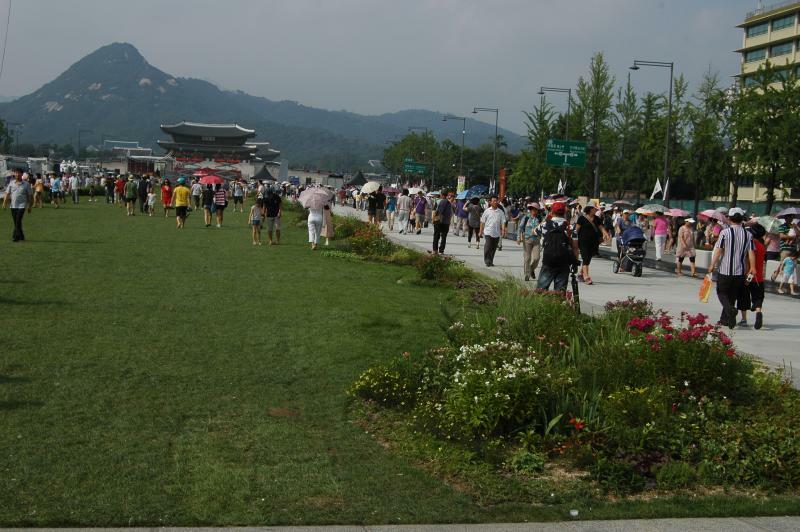 The palace was a must visit place when my parents visited Korea in August. They liked the Korean building structure and were impressed by its size but were totally tired by the amount of walking involved in seeing it! Between where I stand and the mountain on the horizon is Gwanghwamun. The front gate to Gyeongbokgung has been under renovation since 2006, but the wait is over - and with it is the wait to appreciate Korea's foremost palace in its entirety. The event also celebrated Liberation Day (also called V-J day if you're from the UK), or August 15th as it's known elsewhere. If you're from the US, you might be familiar with September 2nd as 'V-J day'; if you're studying holidays you don't get off of work or school, check out this Wikipedia article for more information.